Would you like to increase your beekeeping skills? An Intermediate Bee School, co-sponsored by RIBA and RIC will usually be held in July at Rhode Island College. It consists of a 2 hour classroom session and a 1 hour lab in the apiary at the college. The school will be taught by Betty Mencucci and is open to all members of RIBA who have some beekeeping experience or who have taken the beginner class and are seeking to advance their beekeeping knowledge and skills. Dates for the class are still being determined. Dates will be announced soon. 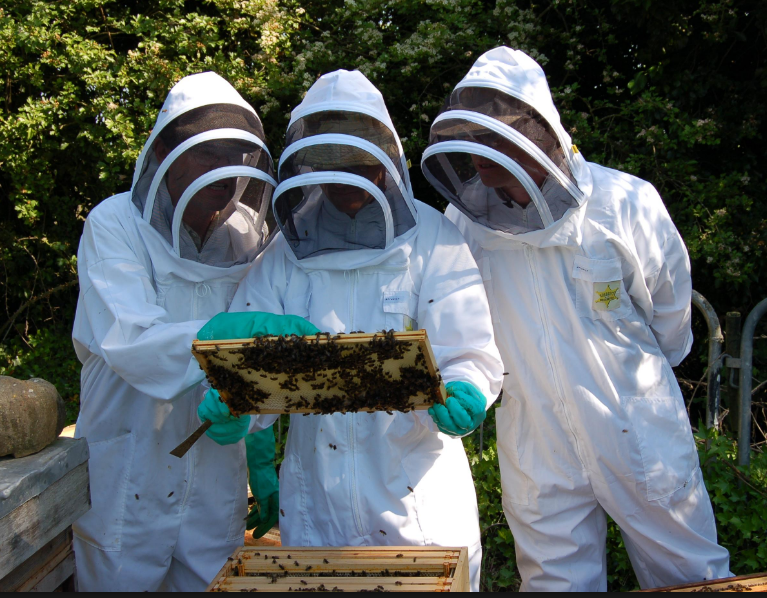 The class will deal with subjects such as colony inspection, finding the queen, requeening a colony, evaluating the strength and health of the hive, swarm prevention, creating splits, best practices for colony management and expansion, and determining levels of varroa mites and best treatment methods. The cost of the class is $35 for members and $50 for non-members(includes membership through 12/31/20). The number of enrollees will be limited to 25 students per class. Would You Like to Learn Beekeeping? Beginner Beekeeping Classes start in February each year. The next RIBA Bee School is to prepare new beekeepers for starting hives in Spring 2020. We will be offering 4 beginner courses in beekeeping. Each course is 5 weeks long and begins in January-February 2020. The course will cover everything the beginning beekeeper needs to know. Subjects will include getting started, the honeybee life cycle, choosing an apiary site, buying bees and equipment, assembly of the hive, installing package bees, catching swarms, nectar sources, bee diseases and pests, hive inspections and wintering. A variety of beekeeping equipment will be displayed and demonstrated. If you have questions, please email Betty Mencucci at bmencucci@verizon.net or call 401-568-8449. Remember that some classes fill quickly! A confirmation email will be sent to you once you are on the list. In December 2019 you will receive an email with information about the classes offered and how to enroll. Please make sure your email is legible. If you DO NOT receive a confirmation, check your SPAM box first, then email Betty Mencucci asking for the confirmation. NOTE: If you are paying for bee school as a Christmas present and want to keep it as a surprise gift, please make notations on the form as to what email the confirmation should be sent to and what email is for the bee school student. The cost of the class is $35 for members and $50 for non-members(includes membership through 12/31/19). The number of enrollees will be limited to 25 students per class. It has been very popular and successful for folks to get on the Advance Notice List to get registration information as soon as it becomes available in the Fall, 2018. It doesn’t obligate you to anything but you will be the first to know when we know. This course will cover everything the beginning beekeeper needs to know. Subjects will include getting started, the honeybee life cycle, choosing an apiary site, buying bees and equipment, assembly of the hive, installing package bees, catching swarms, nectar sources, bee diseases and pests, hive inspections and wintering. A variety of beekeeping equipment will be displayed and demonstrated each week.